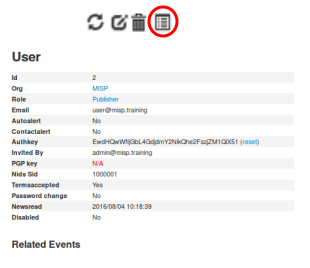 Administration · User guide of MISP Malware Information Sharing Platform, a Threat Sharing Platform. [x] Users - Reviewed/Updated on: ? [x] Organisations - Reviewed/Updated on: ? [x] Roles - Reviewed/Updated on: ? [x] Tools - Reviewed/Updated on: ? [ ] Server Settings - Reviewed/Updated on: ? [ ] Jobs aka. Background processing - Reviewed/Updated on: ? [ ] Scheduled Tasks aka. Background processing - Reviewed/Updated on: ? As an admin (not to be confused with Org Admin), you can set up new accounts for users, edit user profiles, delete them, or just have a look at all the viewers&apos; profiles. Organisation admins (Org Admin) are restricted to executing these actions exclusively within their own organisation’s users only. Email: The user&apos;s e-mail address, this will be used as his/her login name and as an address to send all automated e-mails as well as e-mails sent by contacting the user as the reporter of an event. Set password: Tick the box if you want to define a temporary user-password for the user. If you don&apos;t, you should use the action button &apos;reset password&apos; in the &apos;List Users&apos; view to generate one and send it by email to the user. Password: This textbox is displayed only when &apos;Set password&apos; is ticked. A Temporary password for the user that he/she should change after the first login. 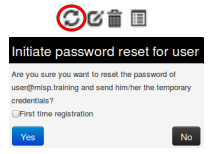 Ensure that password pass the MISP password policy. Confirm Password: This textbox is displayed only when &apos;Set password&apos; is ticked. This should be an exact copy of the Password field. 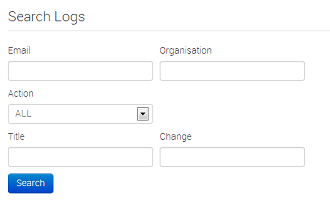 Organisation: A drop-down list enables you to choose an organisation for the user. To learn more about organisation, click here. Roles: A drop-down list allows you to select a role-group that the user should belong to. Roles define user privileges attributed to the user. To learn more about roles, click here. Authkey: This is assigned automatically and is the unique authentication key of said user (he/she will be able to reset this and receive a new key). It is used for exports and for connecting one server to another, but it requires the user to be assigned to a role that has auth permission enabled. NIDS Sid: ID of network intrusion detection systems. Sync user for: Use this option for granting the user the right to synchronize the event between MISP server. This option is available for admin, Org Admin and Sync user role. 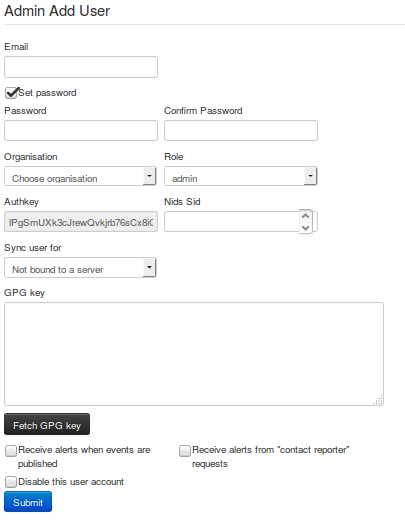 Gpgkey: The key used to encrypt e-mails sent through the system. Fetch GnuPG key: Fetch GnuPG public key. Receive alerts when events are published: This option will subscribe the new user to automatically generated e-mails whenever an event is published. Receive alerts from "contact reporter" requests: This option will subscribe the new user to e-mails that are generated when another user tries to get in touch with an event&apos;s reporting organisation that matches that of the new user. Id: The user&apos;s automatically assigned ID number. Org: The organisation that the user belongs to. Email: The e-mail address (and login name) of the user. Authkey: Unique authentication key of the user. Autoalert: Shows whether the user has subscribed to auto-alerts and is continuing to receive mass-emails regarding newly published events that he/she is eligible for. 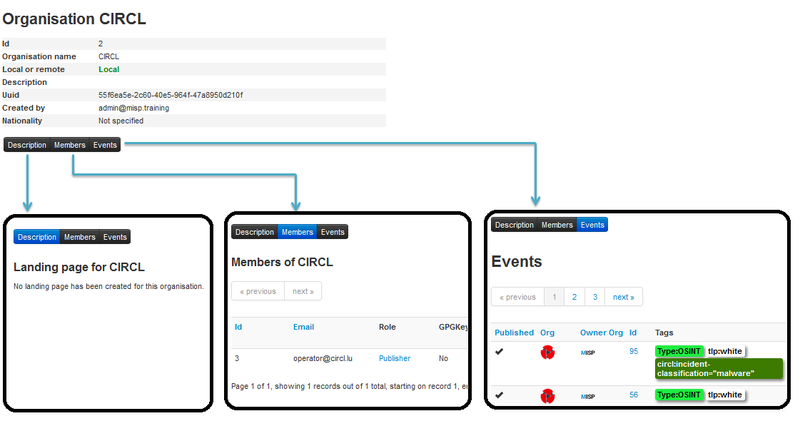 Contactalert: Shows whether the user has the subscription to contact reporter e-mails directed at his/her organisation is turned on or off. Gpgkey: Shows whether the user has entered a GnuPG key yet. Nids Sid: Displays the currently assigned NIDS ID. Last login: Date of last login. Disabled: Displays the user status. Enabled or disabled. Action Buttons: There are 4 options available: reset the password, edit the user, delete the user or display a user&apos;s information. These options are also available on the left menu. Reset Password: Use this action to reset a password. If you&apos;ve created a new user without A password, tick the &apos;First time registration&apos; checkbox to send a welcome message. Otherwise a reset password message will be sent. Change Password: Setting this flag will require the user to change password after the next login. Reset Auth Key: Use this link for generate a new AuthKey. Display the user: Display all user&apos;s information. 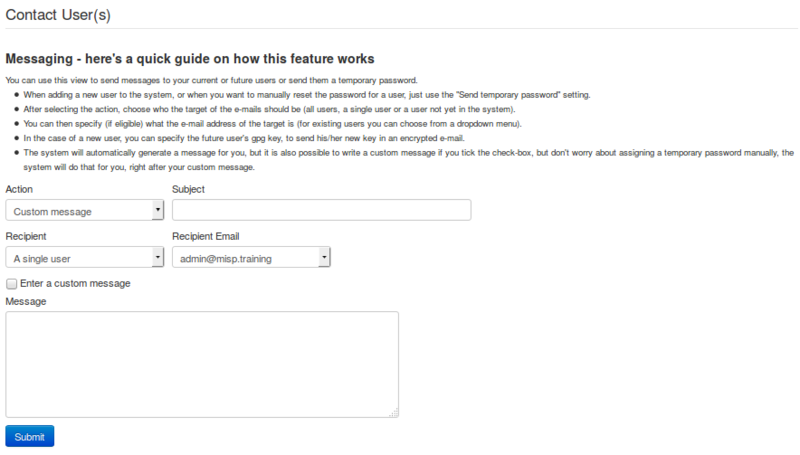 Action: This defines the e-mail type, which can be a custom message or a password reset. Password resets automatically include a new temporary password at the bottom of the message and will automatically change the user&apos;s password accordingly. Subject: In the case of a custom e-mail, you can enter a subject line here. Recipient: The recipient toggle lets you contact all your users, a single user (which creates a second drop-down list with all the e-mail addresses of the users) and potential future users (which opens up a text field for the e-mail address and a text area field for a GnuPG public key). Custom message checkbox: This is available for password resets or for welcome message, you can either write your own message (which will be appended with a temporary key and the signature), or let the system generate one automatically. Keep in mind that all e-mails sent through this system, in addition to your own message, will be signed in the name of the instance&apos;s host organisation&apos;s support team, the e-ail will also include the e-mail address of the instance&apos;s support (if the contact field is set in the bootstrap file), and will include the instance&apos;s GnuPG signature for users that have a GnuPG key set (and thus are eligible for an encrypted e-mail). GnuPG instance key is the GnuPG key used by the MISP instance and which is only used to sign notification. The GnuPG key used in the MISP instance must not be used anywhere else and should not be valuable. Each users belongs to an organisation. As admin, you can manage these organisations. Local organisation: If the organisation should have access to this instance, tick the checkbox. If you would only like to add a known external organisation for inclusion in sharing groups, uncheck it. 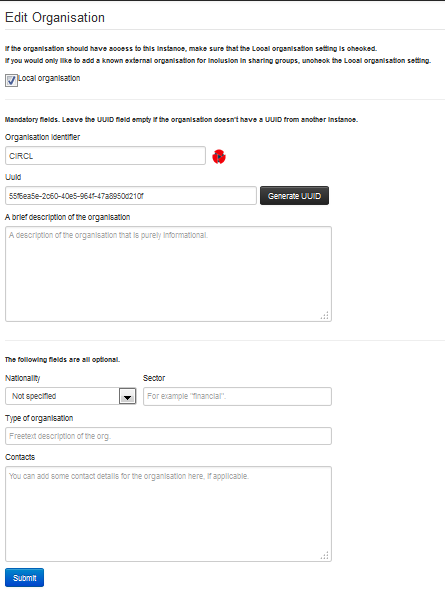 Organisation Identifier: Name your organisation. If you want to add a picture, you should add a file on the webserver using the &apos;Server Settings menu&apos;. Picture should have the same name. To learn more about server settings menu, click here. Uuid: Unique identifier. If you want to share organisation between MISP multi-instance, use the same Uuid. A brief description of the organisation: A word for describing the organisation. Nationality: A drop-down list for selecting the country of organisation. Type of organisation: Define the type of the organisation. Contacts: You can add some contact details for the organisation. Id: The organisation&apos;s automatically assigned ID number. Logo: Picture of the organisation. Name: Name of the organisation. Uuid: Unique identifier of organisation. Share this Uuid when using it between MISP&apos;s multi-instance. Description: Description of the organisation. Nationality: Country of the organisation. Sector: Sector defined for the organisation. Local: Flag defined if the organisation is local or remote. Actions: There are 3 options available: edit, delete or display an organisation&apos;s information. These options are also available on the left menu when you are on the display view. Edit Organisation: Same options of create organisation&apos;s view. Delete Organisation: Use this option for deleting organisation. 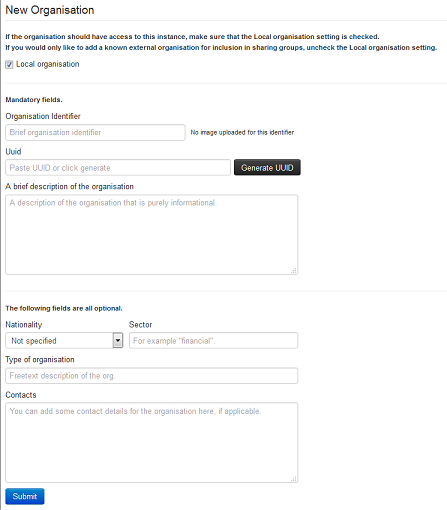 View Organisation: Use this option to display information about the selected organisation. In this view, you can display the user belongs to this organisation and events published by organisation. Merge Organisation menu is available only in the organisation view, under the left menu. Merge one organisation to another will transfer all users and data from one to another. On the left the organisation to merge, on the right the target one. Read Only: This allows a user to browse events that his organisation has access to, but doesn&apos;t allow any changes to be made to the database. Manage My Own Events: The second option, gives its users the rights to create, modify or delete their own events, but they cannot publish them. Manage Organization Events: Allows users to create events or modify and delete events created by a member of their organisation. Manage & Publish Organisation Events: This last setting, gives users the right to do all of the above and also to publish the events of their organisation. Perm Admin: Gives the user limited administrator privileges, this setting is used for an organisation&apos;s admins. Perm Audit: Grants access to the logs. With the exception of site admins, only logs generated by the user&apos;s own org are visible. Perm Tagger: Allows a user to assign tags to events. Perm Sharing Group: Grant access to edit or create sharing groups. Perm Site Admin: Gives the user full administrator privileges, this setting is used for site admins. Perm Auth: This setting enables the authentication key of the role&apos;s users to be used for rest requests. Perm Tag Editor: Grants access to edit or create tags. Perm Delegate: Grant access to delegate the publication of an event to a third-party organization. Perm Sync: This setting enables the users of the role to be used as a synchronisation user. The authentication key of this user can be handed out to the administrator of a remote MISP instance to allow the synchronisation features to work. Perm Regexp Access: Allows users who have this permission enabled to edit the regular expression table. Be careful when giving out this permission, incorrect regular expressions can be very harmful (infinite loops, loss of data, etc.). Perm Template: Grant access to create or modify templates. When creating a new role, you will have to enter a name for the role to be created and set up permissions (as described above) using the drop-down menu and related check-boxes. By clicking on the List Roles button, you can view a list of all currently registered roles and a list of the permission flags enabled for each. In addition, you can find buttons that allow you to edit and delete said roles. Keep in mind that you will need to first remove every member from a role before you can delete it. Id: The role&apos;s automatically assigned ID number. Name: The name of role. Permission: One of the 4 permissions: Read Only, Manage My Own Events, Manage Organization Events, Manage & Publish Organisation Events. Extra Permissions flag: Flag for each extra permissions: Admin, Site Admin, Sync Actions, Audit Actions, Auth key access, Regex Actions, Tagger, Tag Editor, Template Editor, Sharing Group Editor, Delegations Access. Action Buttons: There are 2 options available: Edit Role or Delete it. Edit Role: Same options of create role&apos;s view. Delete Role: Use this option to delete a role. MISP has a couple of administrative tools that help administrators keep their instance up to date and healthy. The list of these small tools can change rapidly with each new version, but they should be self-explanatory. Be sure to check this section after each upgrade to a new version, just in case there&apos;s a new upgrade script in there - though if this is the case it will be mentioned in the upgrade instructions. Since version 2.3, MISP has a settings and diagnostics tool that allows site-admins to manage and diagnose their MISP installation. You can access this by navigating to Administration - Server settings. GnuPG settings: GnuPG related settings. Proxy settings: HTTP proxy related settings. Security settings: Settings controlling brute-force protection and the application&apos;s salt key. Misc settings: Settings controlling debug options, please ensure that debug is always disabled on a production system. Diagnostics: The diagnostics tool checks if all directories that MISP uses to store data are writeable by the apache user. Also, the tool checks whether the STIX libraries and GnuPG are working as intended. Workers: Shows the background workers (if enabled) and shows a warning if they are not running. Admins can also restart the workers here. Download report: Download a report in JSON format, compiled of all of the settings visible in the tool. Priority: The severity of the setting. Value: The current value of the setting. Description: A description of what the setting does. Error Message: If the setting is incorrect / not set, then this field will let the user know what is wrong. The workers tab shows a list of the workers that MISP can use. You can restart workers using the "restart all workers" button. If the button doesn&apos;t work, make sure that the workers were started using the apache user. This can however only be done using the command line, refer to the INSTALL.txt documentation on how to let the workers automatically start on each boot. Worker Type: The worker type is determined by the queue it monitors. MISP currently has 5 queues (cache, default, prio, email and a special schdlr queue). Worker Id: The ID is made up of the machine name, the PID of the worker and the queue it monitors. Status: Displays OK if the worker is running. If the schdlr worker is the only one not running, make sure that you copy the config file into the cakeresque directory as described in the INSTALL.txt documentation. Even if the workers are dead, any actions related to them are on-hold. Nothing is lost. Simply restarting the worker will resume any operations. You can either relaunch them via the UI or manually by running sudo -u www-data bash /var/www/MISP/app/Console/worker/start.sh on the CLI. For reference, below is the script in question. echo "Please DO NOT run the worker script as root"
It is possible to ban certain values from ever being entered into the system via an event info field or an attribute value. This is done by blacklisting the value in this section. Administrators can add, edit or delete blacklisted items by using the appropriate functions in the list&apos;s action menu and the menu on the left. The system allows administrators to set up rules for regular expressions that will automatically alter newly entered or imported events (from GFI Sandbox). Administrators can add, edit or delete regular expression rules, these "expressions" are made up of a regex pattern that the system searches for and a replacement for the detected pattern. The signature whitelist view, accessible through the administration menu on the left, allows administrators to create and maintain a list of addresses that are whitelisted from ever being added to the NIDS signatures. Addresses listed here will be commented out when exporting the NIDS list. While in the whitelist view, click on New Whitelist on the left to bring up the "add whitelist" view to add a new address. When viewing the list of whitelisted addresses, the following data is shown: The ID of the whitelist entry (assigned automatically when a new address is added), the address itself that is being whitelisted and a set of controls allowing you to delete the entry or edit the address. Id: The automatically assigned ID number of the entry. Email: The e-mail address of the user whose actions triggered the entry. Org: The organisation of the above mentioned user. Created: The date and time when the entry originated. Action: The action&apos;s type. This can include: login/logout for users, add, edit, delete for events, attributes, users and servers. Title: The title of an event always includes the target type (Event, User, Attribute, Server), the target&apos;s ID and the target&apos;s name (for example: e-mail address for users, event description for events). Email: By searching by Email, it is possible to view the log entries of a single user. Org: Searching for an organisation allows you to see all actions taken by any member of the organisation. Action: With the help of this drop down menu, you can search for various types of actions taken (such as logins, deletions, etc). Title: There are several ways in which to use this field, since the title fields contain several bits of information and the search searches for any substrings contained within the field, it is possible to just search for the ID number of a logged event, the username / server&apos;s name / event&apos;s name / attributes name of the event target. Change: With the help of this field, you can search for various specific changes or changes to certain variables (Ex. : using "Published" as the search term for and find all log entries where an event has been "Published", ip-src will find all attributes where a source IP address has been entered / edited, etc). If enabled, MISP can delegate a lot of the time intensive tasks to the background workers. These will then be executed in sequence, allowing the users of the instance to keep using the system without a hiccup and without having to wait for the process to finish. It also allows for certain tasks to be scheduled and automated. start: Start a new worker. startscheduler: Start a new scheduler worker. resume: Resume a paused worker. cleanup: Terminate the job that a worker is working on with immediate effect. You will be presented with a choice of workers to choose from when executing this command. restart: Stop all Resque workers, and start a new one. stats: Display some statistics about your workers including the count of successful and failed jobs. tail: Tail the various (workers) log files that CakeResque creates, just choose the one from the list that you are interested in. track: Track a job status. load: Load a set of predefined workers. The other commands should not be required, instead of starting / stopping or restarting workers use the supplied start.sh (it stops all workers and starts them all up again). For further instructions on how to use the console commands for the workers, visit the CakeResque list of commands. Worker: The name of the worker queue. There are 3+1 workers running if background jobs are enabled: default, cache, email, and a special Scheduler (this should never show up in the jobs table). Job Type: The name of the queued job. 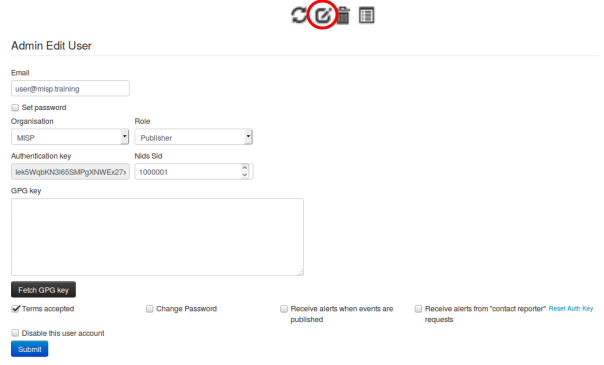 Input: Shows a basic input handled by the job - such as "Event:50" for a publish email alert job for event 50. Message: This will show what the job is currently doing or alternatively an error message describing why a job failed. Org: The string identifier of the organisation that has scheduled the job. Status: The status reported by the worker. Retries: Currently unused, it is planned to introduced automatic delayed retries for the background processing and thus add resilience. Progress: A progress bar showing how the job is coming along. Id: The ID of the task. Type: The type of the task. Frequency (h): This number sets how often the job should be executed in hours. Setting this to 168 and picking the next execution on Sunday at 01:00 would execute the task every Sunday at 1 AM. Setting this value to 0 will make the task only run once on the scheduled date / time without rescheduling it afterwards. Scheduled Time: The time (in 24h format) when the task should be executed the next time it runs (and all consecutive times if a multiple of 24 is chosen for frequency). Next Run: The date on which the task should be executed. Description: A brief description of the task. Message: This field shows when the job was queued by the scheduler for execution. You can also set a default distribution level for attributes contained in an event with default_attribute_distribution, and it has the same values as the default sharing level for events plus an additional one that allows attributes to inherit the sharing level of the event. You can add a logo for your organisations in MISP by uploading them via the tab Manage files under the Administration menu & Server Settings sub-menu. The filename must be exactly the same as the organisation name that you will use in MISP. It is recommended to use PNG files of 48x48 pixels. If you already made sure that you copied the config file under the cakeresque directory, it might be due to the FQDN of the server hosting the instance has changed. A way to fix this is to flush temporary data stored in redis. This can be done by logging in redis, for example when logging in with redis-cli, and issuing a flushall command. Here is a sample configuration for Apache webserver. Or will give you an error page in browser. The preferred method for support & feature requests is to use the GitHub ticketing system. If you want to discuss something related to MISP, want some help from the community, etc… You have the MISP Users mailing list and the MISP developers mailing list. A number of companies offer custom development, consulting, and support around MISP, please check the support page of the MISP Project website. Apache error logs: Rotating logs generated by apache, logging error messages, by default (on Ubuntu) they are found in /var/log/apache2/misp.local_error.log. This error log file will generally not be used by MISP, however, if there is a PHP level error that prevents MISP from functionining you might have relevant entries here. MISP error log: Generated by MISP, logging any exceptions that occur during usage. These can be found in /var/www/MISP/app/tmp/logs/error.log (assuming default installation path). If you see errors in here and are stuck with an issue let us know via GitHub! MISP debug log: Generated by MISP, any debug messages and Notice level messages will be sent to this file. Generally less interesting, but can be helpful during debugging sessions. It should not be necessary to monitor this under normal usage. The file can be found in /var/www/MISP/app/tmp/logs/debug.log (assuming default installation path). By default, MISP logs all failed login and authentication attempts in the built in Audit logs. To view any such failed attempts, simply log in as a site admin and navigate to Audit - List logs. There are two types of entries that will be interesting if you are looking for failed authentication attempts, entries of action "auth_fail" (for failed attempts to authenticate via the API key or the external authentication system) and login_fail (for failed login attempts via the login page). You can also search for any such entries using the Search Logs feature, simply choose the desired action from the two listed above and hit search. In order to enable IP logging for any logged request in MISP, navigate to Administration - Server settings - MISP settings and enable the MISP.log_client_ip setting. It is also possible to enable full logging of API and external authentication requests using the MISP.log_auth setting in the same location, but keep in mind that this is highly verbose and will log every request made. In addition to the information above, all accessed resource URLs are also logged. By default the garbage collection of sessions is disabled in PHP. It is possible to enable it, but it&apos;s not recommended and as such MISP provides a manual way of clearing the sessions. Navigate to the diagnostics screen of MISP (Administration - Server settings - Diagnostics) and near the bottom of the page there will be a counter showing the count of currently stored expired sessions. Simply purge them by clicking the applicable button when the number grows too large. If you have an IPv6 enabled OS, but an older redis version that does not support IPv6 (<v2.8), MISP might fail to connect to the redis server while redis-cli is working. The reason is that redis-cli is connecting to 127.0.0.1 directly, while the calls inside the CakeResque library used by MISP are done using "localhost" which resolves both to the IPv4 and IPv6 loopback addresses. For some reasons, the use of the IPv6 address is attempted first which fails. You can confirm this by trying to connect to redis using telnet localhost 6379. If it fails, the error message should mention the IPv6 loopback address (::1). 1) Upgrade your redis to a server that supports IPv6 (v2.8+). This is the preferred recommendation. The Jobs tab gives you an overview on any currently running jobs or jobs that were previously completed and their status. Typically this is one of the places you would turn to even some background process might not complete as expected to get an indication on any issues related to user initiated Jobs. You can also purge the entries, either only by completed status or purge all. This is not automated and needs to be done manually.
""" Here you can schedule pre-defined tasks that will be executed every x hours. You can alter the date and time of the next scheduled execution and the frequency at which it will be repeated (expressed in hours). If you set the frequency to 0 then the task will not be repeated. To change and of the above mentioned settings just click on the appropriate field and hit update all when you are done editing the scheduled tasks. Warning: Scheduled tasks come with a lot of caveats and little in regards of customisations / granularity. You can instead simply create cron jobs out of the console commands as described here: Automating certain console tasks """
The task scheduler is a sub-par component to enable minimal functionality in terms of automating certain MISP tasks. If you have a dedicated and concious MISP Site Admin she can keep an eye on the Scheduler to make sure everything runs smoothly. For better performance please use a real scheduler like your systems&apos; crontab. As a rule of thumb: If you can click on it, MISP can automate it. All you need is to copy the the sample config and make sure it is correct. Then launch the script. In a similar fashion you can restore your MISP instance with the misp-restore.sh script. Read the script for details.